Sometimes, I really want to make something beautiful. The problem is that I am NOT artistic in the classical sense. I don’t paint or draw or write poetry. I am creative…with food and with work (political strategy needs to always be fresh) but not artistic. A big difference in my mind. My food is usually visually interesting…not necessarily pretty. Most of the time, that is enough for me. Today, not so much. The way to fix this? Dessert. One that takes a bit of tedious fingerwork. Not too much, don’t worry. I don’t have the patience for that! This recipe isn’t hard to make. It just take a little bit of time and close attention to detail. It isn’t really a recipe so much as a method for making a few ready made ingredients into something beautiful. I try to make everything from scratch. I think it tastes better and is, of course, better for you but, as I have mentioned before, puff pastry is the one major exception this rule. The store bought dough can be very good if handled properly and making it by hand takes so long that it really isn’t worth it. I did make up for using a store bought, pre-made ingredient by using my own homemade Papaya Jam though! 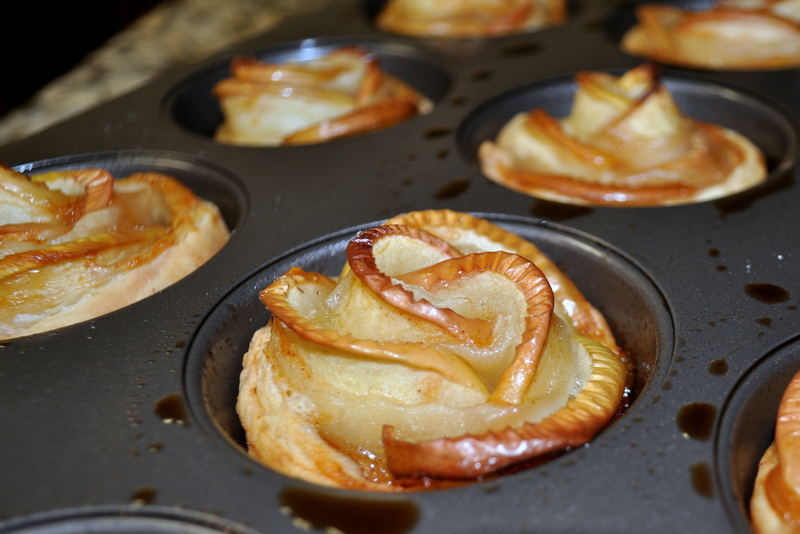 Keep your puff pastry in the fridge until you are ready to start rolling it up with the apples. It can be very hard to work with when warm. Slice the apples very evenly. Very thin is best but you can make them thinner as long as they are consistent and you parboil them for a bit longer to make sure they are flexible enough to bend when you roll the pastry. Save the apple syrup! Add another cup or so of sugar and some cinnamon sticks, ginger, or star anise to the liquid after you are done parboiling the apples. Let this reduce while the pastries are cooking. Then use that syrup as a base for Apple Pie flavored cocktails. Two in one! Yum! Update: I am happy to say that this post was featured on Olives-n-Okra’s Fantastic Friday (May 8, 2015)! This looks like a lot of apple slices but you will need every last one of them! See how the apples come together to form a flower shape? Any sweetener that melts completely. I would recommend using a liquid instead. Perhaps honey or agave. Hey Molly, h r u doing? Ok, I’ll go with what you have suggested and keep the recipe quite simple using the lite honey. Was going through your blog and juz loved “Roasted Cherry Tomatoes & Sausages”. It’ll be my dinner tonight! Thank you! They are beautiful and so easy to make. Lovely recipe that is pleasing and tasty. How can you say you are not artistic after making such beautiful Rosettes? so pretty! and hats off to you..those look like a labour of love! This looks and sounds delicious! Definitely pinning this one. Popping in from the Funtastic Friday Link Party. I definitely need to make these! Yum! These looks gorgeous…and tasty, too! Thanks for linking up and sharing with us at Funtastic Friday. This post is featured this week on Funtastic Friday.